Of all days to forget I own a camera. This was from earlier in the day yesterday. There’s so much to take pictures of in this city and what do I do? I forgot to take pictures. 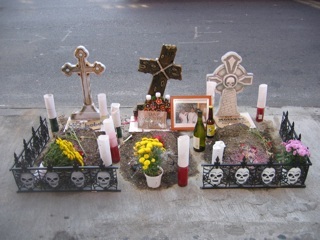 I did manage this one shot of a small tableau or altar or something on the street. But I brought my camera to the parade and meant to shoot a movie from inside the parade looking out and TOTALLY forgot to pull out my camera at any point. What can I say? I’m an idiot. The parade was fun as usual, after the hours of waiting to actually march. And we were almost dead last. I bought myself a tiny pumpkin pie to have as a present after the parade. To reward myself for hours of fun?? I do not know my own logic. But I went to a diner after the parade with a friend and I wasn’t hungry when I got home. So I have pie for today!! Today is pie day! Pie for everyone!